In Germany (“Between neighbor’s gardens a fence is good”), fences are a good thing. They keep cattle in and bad things out. Robert Frost's Poem "Mending Wall" (http://writing.upenn.edu/~afilreis/88/frost-mending.html) really brought the old saying "Strong fences make good neighbors." They define land ownership. They look good. I hate them. I have two nice scars on my right leg. One is a long and jagged on the inside of my knee - from Texas. My dog was on point and I needed to cross a barbed wire fence in a hurry. It was a new and substantial fence, and going over, I stumbled and felt some pain, but the fence let go, and I made it across in good order. I kicked up the covey and got a double, as I recall. Do we ever "recall" anything else? A few minutes later, my right boot got wet and squishy. "Odd!" I thought,"I haven't been through any creeks!" A quick check revealed a nice gash about 3" long and, by now, 1/2" wide. That night, I put some EMT Gel in the wound and wrapped it up. A couple of weeks later, I was good as new. The second one is from Nebraska and a similar, though less gory, situation. Crossing a barbed wire fence is always problematic. Most can be stepped over by pushing down on the top wire. Failing that, rolling under the bottom wire may work. Or, stepping up the wire, near a post, like a ladder. All of these choices have their own special danger. Straddling barbed wire, while expedient, puts tender parts of male (and female) anatomy close to sharp metal spikes. Rolling under puts the bird hunter down in the dirt with sandspurs. And, climbing wire over a metal post just sounds dangerous. (It is, and I have another scar on my stomach to prove it!). 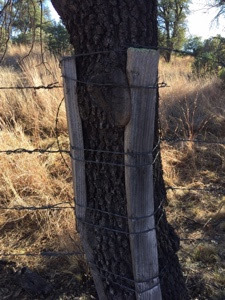 This old fence has become part of the tree! Or, the other way around. There are many things a man in my situation could be thinking at this point. I, in my infinite wisdom, was thinking, "I hope Wally isn't seeing this!" As I began to topple backwards, I raised my left hand to save my old Fox, and gripped the fence tighter with my right to perhaps slow or stop my slide to the rocks under my right foot. I'm still amazed at how fast a body can pick up speed (28 feet per second squared) and how quickly it can stop when it hits Arizona rock! Just as I hit with my vest supplies impacting my lower back, my left foot released and I was sprawled out on my back, left arm up (gun secured! ), right hand still gripping the fence and stunned. I wanted to laugh, but it hurt. Just then I heard the covey flush, and, louder yet, my hunting partner stay conspicuously silent. After I managed to cross the fence on the second attempt, we failed to find the birds, And, much more to my chagrin, my fence crossing abilities were no longer a subject of speculation, but a matter of record. Dang, my back hurt. I hate fences.